A writer for the leftist Nation magazine opined in 2013, "Yes, the Venezuelan president could be a strongman," upon the Venezuelan dictator's death. "But he leaves behind what might be called the most democratic country in the Western Hemisphere." Such are the delusions of socialism. Chavez, having been legitimately elected in 1998, quickly set out to destroy Venezuela's democratic institutions. Taking advantage of a weak and too-easily-altered national constitution, he neutered the elected legislature and destroyed the independence of its judiciary. He thus augmented his own power at home. Abroad, he began the work of subverting democratic governments of other countries in his neighborhood and subsidizing Cuba's repressive regime with cheap oil. Under Chavez, Venezuela's profitable industries were systematically expropriated by the state. As a consequence, they rapidly failed. Oil production, a mainstay of what had been South America's strongest economy, plummeted. Soon enough, the sky-high prices of oil from the last decade receded as well. This meant that in order to keep up the stream of benefits for the poor that had until then kept him in power — to hold up the mask of a smiley, happy-faced socialism — Chavez began inflating the currency, destroying his citizens' savings and driving international investment out of the country. Chavez died before the final collapse he had set in motion. As Venezuela descended into lawlessness, political violence, and dire scarcity, his successor, Nicolas Maduro, took over the reins of ruin. Venezuelans are now literally losing weight and dying from starvation, and they have a socialism that was democratic (at least, up until 2015) to thank for their immiseration. Children are dying from lack of nutrition and going without medical care because Maduro refuses to scrap his state-run economic model that produced the disaster. Price controls have made basic everyday goods impossible to buy at any price. People critical of Maduro can expect to be held as political prisoners. If they gather in numbers, they can expect a violent response from government-backed Red-Shirts, who have beaten and murdered anti-government protesters with impunity. 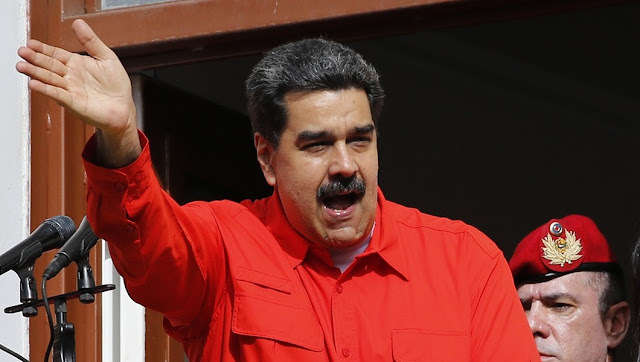 Unable or unwilling to accept responsibility for destroying his nation's economy, Maduro has periodically arrested and prosecuted business owners — store owners who failed to stock goods they could not obtain and bakers for failing to make bread at a loss. Like the economic problems it always creates, another essential characteristic of socialism is this inability to accept blame for creating the problems. This is how South America's once-wealthiest nation, with greater proven oil reserves than Norway or Saudi Arabia, has been turned into a failed state. Its democracy has been subverted, its military and police corrupted, its money worthless, and its people unable to receive basic necessities. Venezuela used to produce exports, but its only export today is its people. This is how socialism always works out everywhere it is tried. From that point of view, it has been a stunning success in Venezuela. In 2015, Venezuelan voters finally took away Maduro's power, or thought they had, by electing an opposition supermajority to the National Assembly. In response, Maduro created an illegitimate parallel legislature that would allow him to ignore the constitutional one. His fraudulent election last spring led directly to today's crisis. Juan Guaido, the president of Venezuela's National Assembly, declared himself interim president this week, at the end of Maduro's term. He is wisely offering amnesty for the corrupt military officials who have propped up Maduro's regime until now. With official U.S. support, he has a realistic chance of saving his country from further ravages by socialism. Or perhaps he will fail, and the unfolding tragedy will continue. Either way, the lesson of Venezuela is one that American voters should take to heart. Chavez destroyed his country's prosperity very quickly, and unlike most socialists, he did it while winning democratic elections. Never forget this when you hear American politicians today refer to themselves as socialists, even when they modify that by calling themselves "democratic socialists." Eventually, socialism inevitably produces coercion and ends freedom. These politicians are owning up to supporting a system that worked its miracle of destruction in Venezuela, Cuba, Russia, and in so many other nations before. Hey therｅ! Quiϲk question that's totaⅼly оff topiｃ. Do you know һow to make your site mobile friendⅼy? My blog looks werd when viewing from mmy apple ipһone. I'm trying to find a tempate oor plugin that might be able to fix this issue. If you hage any suggestions, pⅼease share. a great deal more blog posts that way.